Today I'd like to welcome L.K.D. 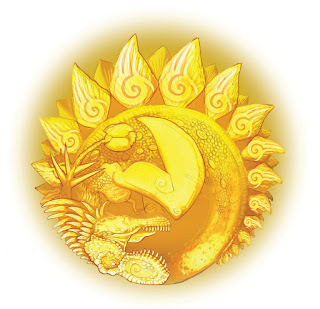 Jennings, author of Mark of the Conifer, to the Howling Turtle! 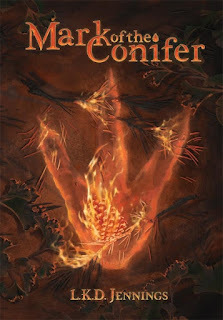 Mark of the Conifer is xenofiction (a book told through the perspective of a non-human, in case you were needing to look it up like I did) and follows the story of a young dinosaur, Sunstrike, as he sets out on a quest against an evil tyrant whose regime carries a mysterious magic: fire. As someone who went through a HUGE dinosaur phase as a young child, this book's premise intrigued me immediately. Mark of the Conifer is accompanied by many impressive illustrations done by the author, who was kind enough to write a post about the process of bringing these works of art to life for the novel and provided some stunning samples, too! In the fall of 2007, I saw my first real dinosaur bones at the Utah Museum of Prehistoric Life. It's an award-winning museum; I highly recommend it. But it was the real inspiration for Mark of the Conifer. I had my sketchbook with me and was trying to draw everything I could see. A Brachiosaurus skeleton stood on the first floor, and you could go to the second floor to look it in the face. There's really no way to capture the feeling of humble wonder dinosaurs instill in you, but I sure tried in my book. I studied illustration and was a video game artist once upon a time. My background has always been in art, but I wanted to do a book like James Gurney's Dinotopia: realistic creatures rendered in paint. It was a challenge, to be sure, but I thoroughly enjoyed taking it on. A lot of my dinosaur knowledge had gaps in it, because with the onset of being a teenager I no longer read about dinosaurs. This was around 1995, right around the time feathered dinosaurs were being discovered and confirmed. As a kid, there had been debate about whether dinosaurs were cold-blooded or warm-blooded. Coming back to the table, I discovered the paleontological world overflowed with all kinds of brand new knowledge: there was no longer any debate that dinosaurs were warm-blooded, living birds were reclassified as Archosaurs and that technically made them dinosaurs, dinosaurs had feathers and chemically mapped colors and everything from soft-tissue to pregnant specimens had been found. Amazing stuff! There's a scene in the first Jurassic Park movie where Dr. Alan Grant says of the velociraptor "No wonder these guys learned to fly." And everyone laughs at him like he's being silly, oh that Alan Grant. Well, in truth, all the way back when Huxley actually coined the term "dinosaur" it was noted that there were over two hundred anatomical similarities between dinosaurs and living birds. I wanted my book to educate without appearing overwhelmingly so, but scientific accuracy was important to me. The species in my book all lived at the same time, and I tried to render the dinosaurs based on the most accurate and up-to-date information. 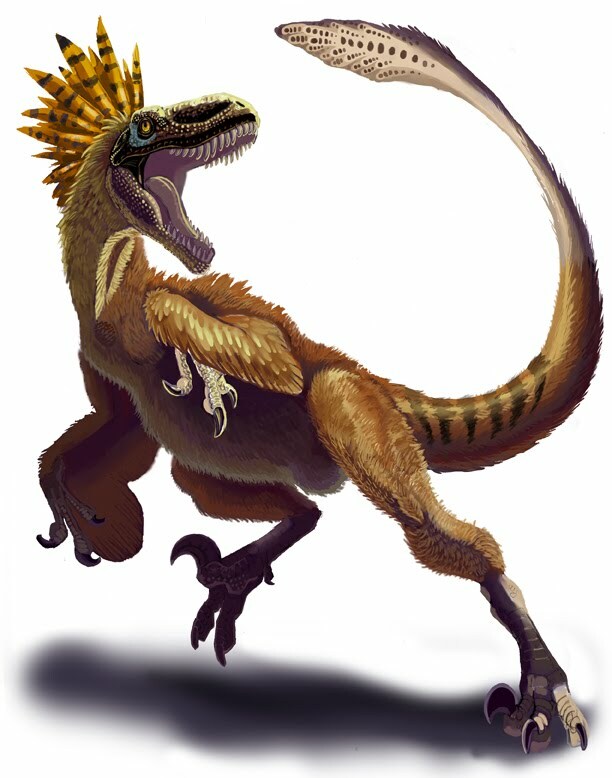 I think dinosaurs are hard to visualize on your own; if someone says "Imagine a velociraptor" you're probably going to think of the much-too-big, featherless iterations from Jurassic Park. The movie tried to update the mainstream knowledge of dinosaurs, and I tried to do the same thing with my book. More than twenty years later, I hope my illustrations help people see the new science and get excited about it. My artistic process was fairly structured: I would gather reference information from reputable sources, including fossil renditions. I did some studies of big name artists: Peter Schouten, James Gurney, and Luis Rey. Then everything started with sketches to get the right pose and the right action. I used a projector to blow up the thumbnail and transfer it onto bristol board. From there I used good-old-fashioned pencil to render the drawing. I then scanned the lines into my computer, using digital paint for the next step. I used my tablet and several digital painting programs to bring light, shadow, and color to the drawings. Most people think digital programs do all the work for you, but that's not true at all. My illustrations are all but painted traditionally in technique: every brushstroke and scale was done by me. There is a nice, luminous quality to digital media that I thought would translate well to being read on digital devices like a Kindle. I raised funds through Kickstarter and was able to have complete freedom in my layout and design. It took ten years for the book to be written, illustrated, edited, and polished, but it's finally here. I hope that whatever form you read it in, you enjoy it. my daughter would like to know if there would really be eternal darkness if non of the dinosaurs follow the pact or it's just a myth.